Past research indicates that a history of depression and exposure to abuse and neglect represent some of the most robust predictors of depression in emerging adults. However, studies rarely test the additive or interactive risk associated with these distinct risk factors. In response, the present study explored how these three risk factors (prior depression, abuse, and neglect) synergistically predicted prospective depressive symptoms in a sample of 214 emerging adults (Mage = 21.4 years; SDage = 2.4; 78% females). Subtypes of maltreatment and lifetime history of depression were assessed through semi-structured interviews, and depressive symptoms were assessed annually for three years via self-report measures. The results indicated that for both males and females, a lifetime history of depression, abuse, and neglect-exposure uniquely conferred risk for elevated depressive symptoms. Furthermore, the interaction between neglect and prior depression forecasted increasing depressive symptoms, and a history of abuse also predicted increasing depressive symptoms, but only in females. These findings are contextualized within extant developmental psychopathology theories, and translational implications for trauma-informed depression prevention efforts are discussed. The authors would like to thank Hailey Hedden for her contributions to the early stages of this manuscript. J.R.C. conceptualized the aims and hypotheses, conducted the statistical analyses and drafted the manuscript. K.N.T. conceptualized the aims and hypotheses and helped draft the Introduction and Discussion. A.R. made substantial contributions to the acquisition, scoring, and management of the data. S.B. made substantial contributions to the acquisition, scoring, and management of the data. T.S. made substantial contributions to the acquisition, scoring, and management of the data. T.R.K. contributed to the overall design of the study, the management of the data, and the preparation of the manuscript. N.B.-V. is the director of the project, designed the methods, oversaw data collection, and contributed to the preparation of the manuscript. All authors read and approved the final manuscript. Authors are supported by the Spanish Minesterio de Economica y Competitividad (PSI2017-87512-C2-01) and the Comissionat per a Universitatis I Recerca of Generalitat de Catalunya (2017SGR1612). J.oseph R. C.ohen is supported by the National Institute of Justice (2018-R2-CX-0022). N. B.arrantes-V.idal is supported by Institucio´ Catalana de Recerca i Estudis Avanc¸ats (ICREA) Academia Award and Centro de Investigacio´n Biome´dica en Red de Salud Mental (CIBERSAM), Instituto de Salud Carlos III, Barcelona, Spain. A. R.acioppi is supported by the Spanish Ministerio de Economı´a y Competitividad (BOE-A-2015-6508) and by the European Social Found (ESF). The funders had no role in study design, data collection and analysis, decision to publish, or preparation of the manuscript. This manuscript’s data are not publically available at this time. This present study was conducted in compliance with the specific requirements of the United States and Spain for retrospective studies. All procedures performed in this study were in accordance with the ethical standards of the institutional and national research committee and with the 1964 Helsinki declaration and its later amendments or comparable ethical standards. Informed consent was obtained from all individual participants included in the present study. Beck, A. T, Steer, R. A., & Brown, G. K. (1996). Beck depression inventory-II. San Antonio, TX: The Psychological Corporation. https://doi.org/10.1037/t00742-000. Cohen, J. R., McNeil, S. L., Shorey, R. C., & Temple, J. R. (2019). Maltreatment subtypes, depressed mood, and anhedonia: A longitudinal study with adolescents. Psychological Trauma: Theory, Research, Practice and Policy. https://doi.org/10.1037/tra0000418. Gutman, L. M., Joshi, H., & Schoon, I. (2019). Developmental trajectories of conduct problems and cumulative risk from early childhood to adolescence. 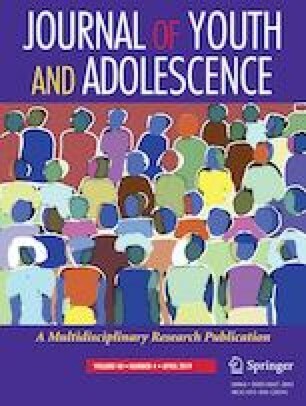 Journal of Youth and Adolescence, 1–18. https://doi.org/10.1007/s10964-018-0971-x. Hilt & Nolen-Hoeksema. (2013). The emergence of gender differences in depression in adolescence. In: Nolen-Hoeksema & Hilt (eds.) Handbook of depression in adolescents (pp. 127–152). Abingdon, UK: Routledge. https://doi.org/10.4324/9780203809518. Post, R. M. (1992). Transduction of psychosocial stress into the neurobiology of recurrent affective disorder. The American Journal of Psychiatry, 149(8), 999. https://doi.org/10.1176/ajp.149.8.999. Reed-Fitzke, K. (2019). The role of self-concepts in emerging adult depression: A systematic research synthesis. Journal of Adult Development, 1–13. https://doi.org/10.1007/s10804-018-09324-7. Sanchez-Villegas, A., Schlatter, J., Ortuno, F., Lahortiga, F., Pla, J., Benito, S., & Martinez- Gonzalez, M. A. (2008). Validity of a self-reported diagnosis of depression among participants in a cohort study using the structured clinical interview for DSM-IV (SCID- I). BMC Psychiatry, 8(43). https://doi.org/10.1186/1471-244X-8-43. Smith, C. A., Greenman, S. J., Thornberry, T. P., Henry, K. L., & Ireland, T. O. (2015). Adolescent risk for intimate partner violence perpetration. Prevention Science, 16(6), 862–872. https://doi.org/10.1007/s11121-015-0560-0.